AUDLEY shoes 2 Tone Lavender Suede Size 5 - New but tried on! Audley Nubuck wedges. Taupe. Size 5/38. Very lightly used. With box. Audley shoes size 6, light brown with cream polka dots, hardly worn. WOMENS AUDLEY LONDON STUNNING TURQUOISE SHOES NEVER WORN✨SIZE 36 (UK 3) RRP £90! 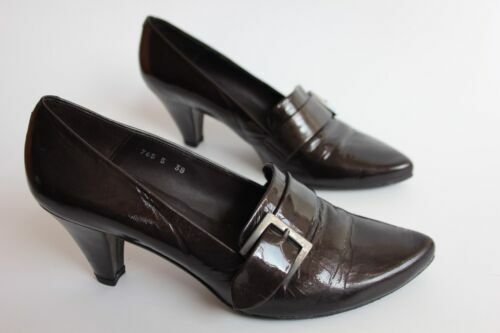 AUDLEY leather Maroon Burgundy Court SHOES Euro 37 NEVER WORN. Audley Quality Leather Shoes. Brown. 4. BMWT. Boxed. New unworn. Audley London Court Shoes. Black suede laser cut over white.Vintage,Retro. 38-5.